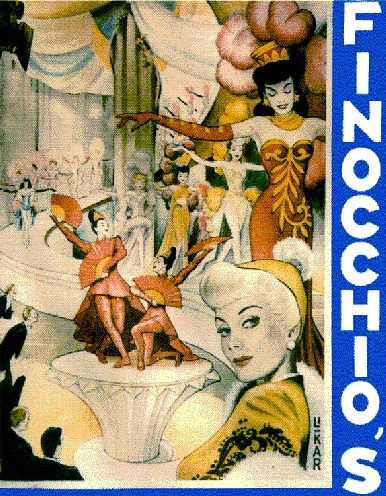 A poster from Finocchio's, date unknown. 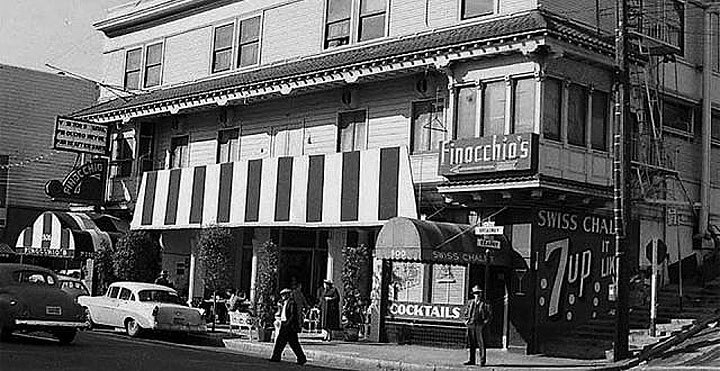 One of the most interesting things I've done recently was prowl around the premises of Finocchio's, San Francisco's fabled female impersonator club, which closed November 27, 1999 after 63 years in the same location. The club's history actually began back in the Roaring '20s, when founder Joe Finocchio opened a speakeasy on Stockton Street on the edge of the seedy Tenderloin District. The place featured female impersonation even then. The club went above-ground with the repeal of Prohibition in 1933 and moved to the trendy North Beach nightclub district in 1936. 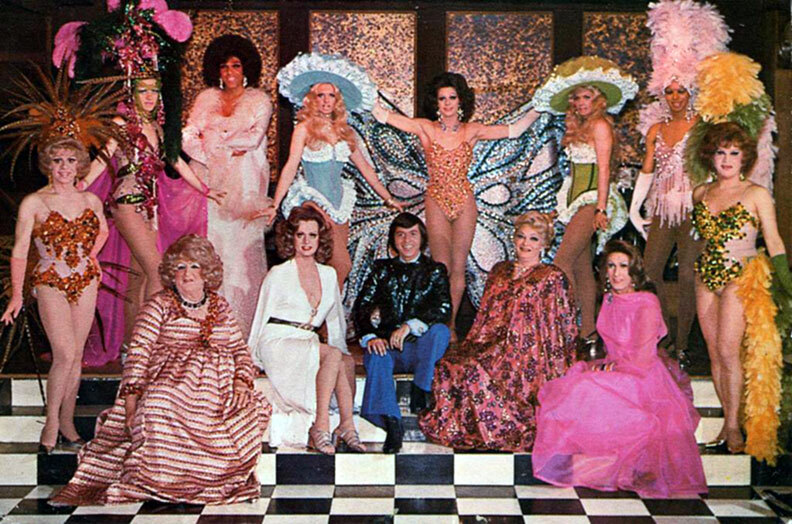 Most gay men and lesbians today don't think of professional female impersonator clubs as being particularly queer, but in the days before gay liberation they provided valuable semi-public social spaces for sexual minorities to congregate. Finocchio's on Broadway, c. 1950s. For decades, Finocchio's was a world-renowned venue. Hollywood stars frequented the club, flying up to San Francisco from Los Angeles to see themselves being impersonated -- as Tallulah Bankhead did in the accompanying photo. Ms. Bankhead is joined by members of the show, including Elton Paris (left) and Lucian Phelps (3rd from left). It's worth noting the mixed-race audience, a rarity in the era of segregation. Well aware of its former glory, I was a bit sad to see Finocchio's look so down at the heels last week as GLBT Historical Society staff members carted away a truckload of memorabilia. The drag club business just ain't what it used to be, and it hasn't been for a good long time. It felt like a piece of old San Francisco -- and old gay life -- had quietly passed away. Joe Finocchio's second wife Eve, a feisty grand dame well into her 80s, sat in a chair in the middle of the room and watched her grandson, the club's manager, box up the liquor stock as we historians circled like buzzards around ratty dressing room fixtures, odd scraps of cast-off costumes, a pair of false eyelashes stored in an empty Premarin prescription bottle, and other detritus that had accumulated over more than half a century. At one point, Eve Finocchio motioned for me to come to her. "Here, honey, why don't you take this, too," she said, handing me an exquisite ermine stole. "I once gave it to a queen who worked here, but he doesn't need it now. He's a Catholic priest. Anyway, I might as well donate it to history -- you just can't get away with wearing fur these days. Check out the GLBT Historical Society for much more information on local queer history. Finocchio’s emcee Carrol Wallace announces “Ladies and gentlemen, let’s bring to the stage the warm and charming personality of David de Alba!” and out walks David in a feathered and spangled gown, coiffed and made up as Judy Garland, Liza Minnelli, or Boy-Chic, singing, dancing and impersonating the ladies he admires. The club on Broadway is big, well-lit and classy, still concerned enough about it’s early days as a pick-up bar in the Tenderloin that the owner’s policy for performers is “Come in as a boy; leave as a boy.” In other words, being seen on the street in drag or mingling with the customers was prohibited. Somehow Eve Finocchio’s favorites, a chorus of Eve-ettes, was exempt. Employees were either Pets or Pests, although David was able to manage staying somewhere in between. Employees nicknamed it The House of Hate. Early each morning, performers reported last night’s infractions to Mrs Finocchio. When David approached her about that she answered “David, I listen to everything they tell me, but I only listen to what I want.” David worked there from the early 1970s until 1989, at first steadily, then sporadically as a ‘guest spot performer’ at the beck and call of Mrs Finocchio. Today, David remembers those years as the best in his life. He hadn’t grown up dreaming of becoming a female impersonator but when the opportunity came, it made sense. He’d been perfecting those skills for years. 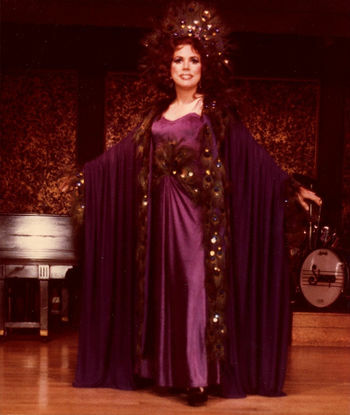 Boy-Chic as Salome at Finocchio's, early 1980s. There were four shows a night for straight audience full of tourists. He became the club’s only Cuban bi-lingual singer, often singing songs made famous by Olga Chorens, such as ‘La Virgen de la Macarena’, but ‘I’m Gonna Live Until I Die’ became his theme song. David’s Chicago stage name, Heri del Valle, difficult for the emcee to announce, was changed to David de Alba and he dubbed his singing persona ‘Boy-Chic’, a take on the Yiddish endearment ‘boychick’. Moving between the salon and the club, life was good and years passed quickly. David was “..often flabbergasted that after the Cuban losses, I was performing in front of stars like Richard Chamberlain, Sergio Franchi, Colonel Sanders and Arthur Murray!” There were always plusses and minuses about Finocchio’s. The pay was dependable but you didn’t know how long you’d be working. “We don’t fire people, we just let them go” was their policy. Dealing with the jealousies and politics among employees took getting used to. One performer was let go for refusing to wear the orange costume Eve Finocchio picked out. But Finocchio’s was also known as The Elephant’s Burial Ground, a place where older performers could continue their careers.